India is predominantly a country of non-vegetarians. It was always known and government surveys say it too. 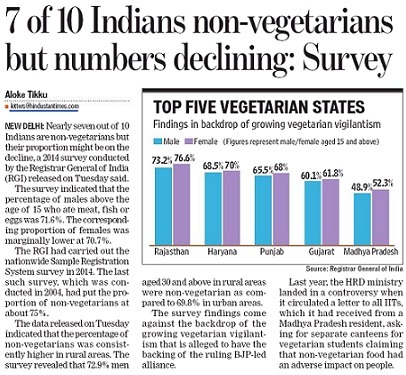 The figures suggested 70-75% Indians are non-veggies. The Registrar General of India (RGI) report that has been released recently, reveals it. Given that some 'vegetarians' don't talk publicly or eat meat without telling family members, the figure could be even higher [80-85%]. Yes, India is a 'mansahari' nation that loves non-vegetarian food--Murgha, Bakra, Machhli, Andey and the rest. But if some of us are shocked to know that India is populated by majority non-vegetarians ie. mansahari people, their surprise is also justified. The reason is the politics over food and the immense propaganda that 'Indians were always vegetarians' apart from statements that it is the land of 'shakaharis'. All the time you hear about the virtues of the ''shakahar" [vegetarian food]. Politicians in North India, taking strong positions over meat eating, in fact, to such extent that they can exhort people to attack or kill the non-vegetarians. Imagine, the level of propaganda that tating non-veg is seen as a vice and against 'Indian culture'. 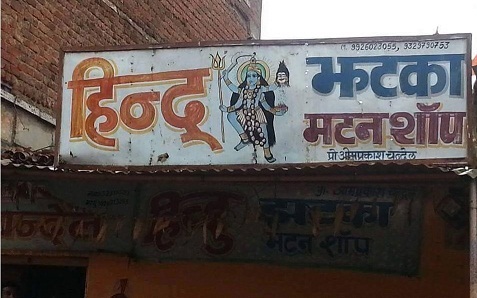 The vegetarian or 'saatvik' food is considered pure and non-veg eaters are deemed impure. Many families that own media houses are strict vegetarians and it is the editorial policy to 'not eulogize non-vegetarianism'. For example, if there is a report that says India has more non-vegetarian eaters, there will be an addition by the paper. A few lines will be inserted in it and the report will be editorialised, turned into an opinion [which is wrong], that non-vegetarian food is bad for health as per researches [there is a search for and against everything on this planet, though]. Majority of Indians are non-vegetarian. The figure is 71.6%. Not just men, women are also meat consumers and their figure is also above 70, just a bit lower than the percentage of the males. Non-vegetarians include those who consume meat, fish or egg. Uttarakhand 73%, Jammu and Kashmir 68.55%, Punjab 66.75%, Haryana 69.25%, Maharashtra 59.8%, Karnataka 78.9%, Assam 79.4%, Delhi 60.5%, UP 52.9%, Madhya Pradesh 49%. 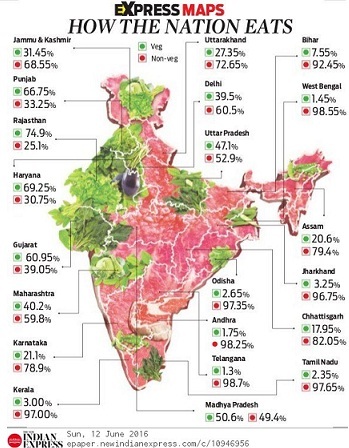 Vegetarian States: Percentage of vegetarians is more than 60% in these states.